It’s time to welcome spring with light and airy scarves that offer a little bit of warmth against lingering chilly winds. 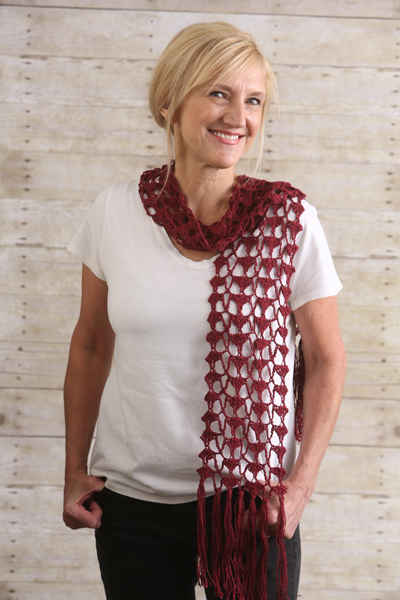 This scarf is quick to crochet and inexpensive to make. 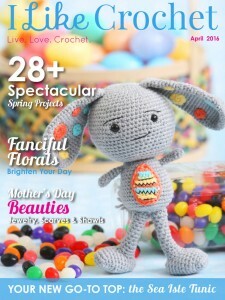 This pattern is worked from the center to the fringed ends. Side 1 is worked, then Side 2 begins by working in the opposite side of the beginning ch of Side 1. Wind yarn around cardboard 42 times for fringe. Cut bottom of loops and set aside. You will have 42-16″ lengths. Row 2: Turn, sl st in first 3 dc and in next ch-3 sp, ch 1, sc in same sp, *ch 4, sc in next ch-7 sp, ch 4, sc in next ch-3 sp; rep from * across. Row 3: Ch 3, turn, (2 dc, ch 3, 3 dc) in first sc, *sc in next ch-4 sp, ch 7, sc in next ch-4 sp, (3 dc, ch 3, 3 dc) in next sc; rep from * across. 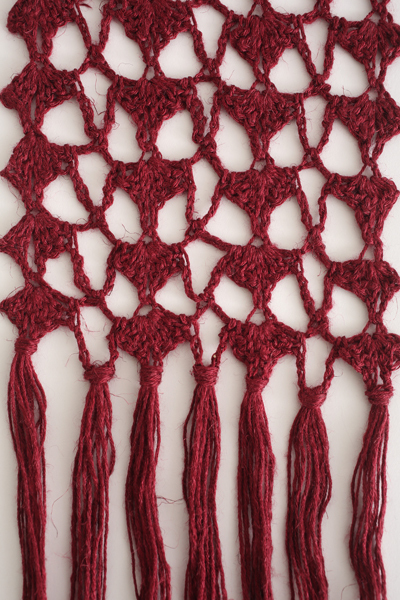 Rep Rows 2-3 for pattern until piece measures 34″ from beg ch or until you run out of yarn, ending by working Row 3. With second ball, wind yarn around cardboard 42 times for fringe. Cut bottom of loops and set aside. Row 1: With RS facing and working in free loops of beginning ch, join yarn with sl st in ch at base of first ch, ch 3, sl st in top of last dc on Side 1, (2 dc, ch 3, 3 dc) in same ch, *sk next 2 ch, sc in next ch, ch 7, sk next ch, sc in next ch, sk next 2 ch, (3 dc, ch 3, 3 dc) in next ch; rep from * across, sl st in top of beg ch-3 on Side 1. Complete same as Side 1, beg with Row 2. Holding 6 strands of cut yarn together, add fringe in each ch-3 sp and ch-7 sp across ends. Trim fringe.